The history of Burpham and Wepham goes back a long way. The area was first settled some 6000 years ago by Neolithic man. 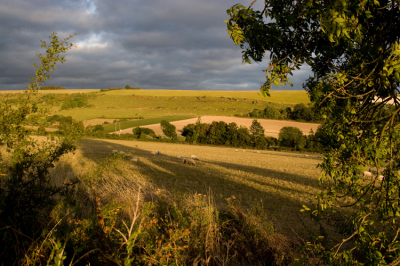 Later, around 4000 years ago farmers were attracted to the area by its flint and fertile lands. Their ancestors still look down on us buried on the hills in their barrows. In 600BC, during the Iron Age period, a defensive fort was probably built at Burpham on or near the site of the Saxon Fort. 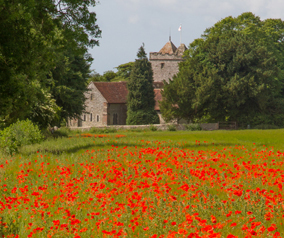 In AD 43 the Romans landed at Bosham and quickly colonised the area staying for the next 400 years. Roman soldiers built the defensive war dykes that still exist today as great furrows between Burpham and Amberley. Although originally centered on Chichester they went on to control most of England. One of the great Roman roads, Stane Street, still bisects West Sussex and is now known as the A29. In the 1860s when the church was being repaired a Roman pavement was discovered indicating that the Romans either had a dwelling here or perhaps a temple. The most significant change came in approximately 900AD. At the time England was controlled by the Danes, only Wessex held out protected by a ring of forts built by Alfred the Great and continued by his son, Edward the Elder. According to the Anglo Saxon Chronicle, the Burghal Hidage, 34 Forts existed ranging from Devon in the west, to Oxford in the North and as far south as Hastings. One of these in the south was Burpham, our name derived from the Saxon word for Fort, Burh, and the Saxon word for village, Ham. The fort was large, stretching from the village green entrance towards Splash Farm in Wepham. 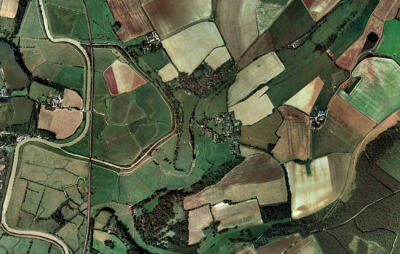 You can see the waisted field in the centre of this picture. The typical construction was to find high ground, preferably already protected by water on one side. The area would consist of raised mounds of earth with a wooden palisade erected on top. Houses and barns would be constructed inside the fort togther with a central defensive building. In most cases a Church would also exist, although Burpham is one of three known Burhs where the church is outside the defenses. This was probably due to an existing church being there before the fort was built. The fort would need to shelter all the local people for a radius of 20 miles together with all their livestock if possible. The fort would need to hold out against the Danes till local militia could be raised to repel the invaders. The fort was active until the Normans invaded in 1066 and after this it fell out of use and gradually disappeared. Today we can still see the outline and the man-made earth works. After 1066, the Normans in Sussex under the control of Roger de Montgomery, concentrated their defensive efforts on building the castle in Arundel. Eventually Montgomery left to become Earl of Shrewsbury and to build many of the Welsh border castles found today, the last Norman to control the area was the Baron FitzAlan and when the last died without male issue the land became the property through marriage of the Duke of Norfolk. As a tribute to the FitzAlan family the then Duke added FitzAlan to his name to become the FitzAlan Howards and it's this family that still live here and own the land around us. Amongst his many titles, the Earl of Arundel is the oldest continuous title in England. Today the land has barely changed in 1000 years. It is still mostly arable and grazed by sheep, the Duke of Norfolk still owns the land and lives in the village when not at the Castle. The village may have lost most of its farming community but we still have families living here who can trace there occupation back 300 years or more. 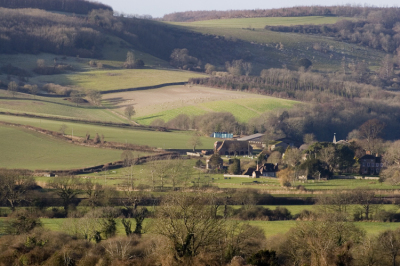 For our visitors it's a charming, isolated community now set within the South Downs National Park that still portrays a timeless charm. This is a link to a pdf of all of the artifacts of Roman and medieval origin that have been found in the area. You can look at an exhasutive summary of Burpham Camp on Pastscape. For those that are interested in a detailed history of the villages, this link has a great deal of supplementary material and a bibliography.